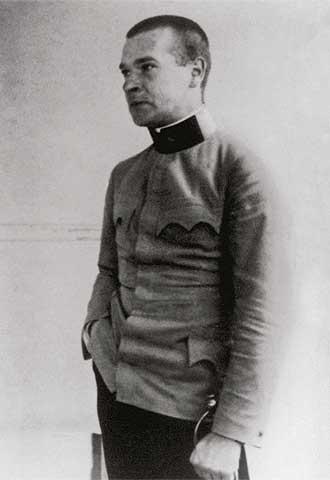 In a good poem made by Trakl images follow one another in a way that is somehow stately. word for deliberately keeping silence, which English does not have. Trakl uses this word “schweigen” often. and the blood that had run from the wounds that day. The Austrian composer, organist, and teacher Paul Hofhaimer (1459-1537) was a great master of German song composition and one of the few Germanic organists widely known throughout Europe. The father, brothers, son, and nephews of Paul Hofhaimer were all organists in Salzburg and Innsbruck. He received instruction from his father and from Jacob von Graz. Hofhaimer’s first important position, that of chamber organist to Archduke Sigismund of Tirol at Innsbruck, was in 1480. He received an appointment for life, and in 1489, upon receipt of an offer from the Hungarian court, he was promoted to the position of director of the court chapel at Innsbruck. During the 1480s he met the composers Heinrich Isaac and Arnolt Schlick and fashioned a reputation as a teacher. In 1490 the emperor Maximilian I took over the musical establishment. Apparently well satisfied with Hofhaimer’s services, he ennobled the composer in 1515. During this period Hofhaimer apparently spent some time at other locations. He may have been at the court of the elector Frederick the Wise at Torgau with Isaac and Schlick. Hofhaimer probably wrote most of his best songs between 1490 and 1510. The German song of this period was generally based on a familiar melody, such as a folk song or court song, which was kept largely unchanged in the tenor. The other parts wove contrapuntally around it. 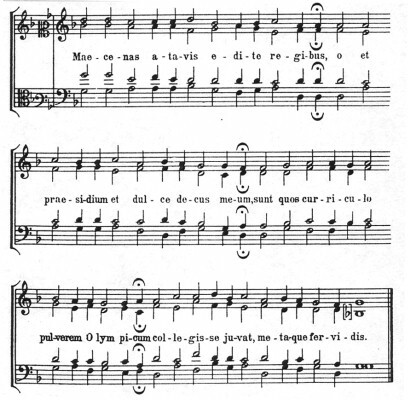 Unlike the songs written in the dominating Franco-Flemish style of the period, the German songs were in closed sections (often in the Bar form—AAB) rather than in continuous polyphony. With Hofhaimer’s generation, progress was made toward equality of parts and strong interpart relation through the use of imitation. There is some melodic preeminence of the soprano part. At Maximilian’s death in 1519 Hofhaimer accepted the post of organist at the Cathedral of Salzburg and held it until at least 1524. He remained a resident of the city until his death. He became interested in the quantitative setting of Latin verse and began setting the Odes of Horace in this manner. After his death Ludwig Senfl completed these settings and published them as Harmoniae poeticae (1539). Only these pieces enjoyed any popularity after Hofhaimer’s death. Although Hofhaimer enjoyed a considerable reputation as an organist and teacher of organists, little of his organ music has survived. This may be due in part to a tradition of improvisation of organ music. Although his pupils have not been definitely identified, his doctrines were apparently widespread among German organ composers of the early 16th century, and elements of the style may have reached Italy. In music of this generation, ornamentation idiomatic to the instrument was applied to the melody, but not so copiously as to obscure the basically sound proportions of the piece. This restraint, which probably characterized Hofhaimer’s music, generally disappeared later in the century under a welter of ornamentation. ♦ Little is known of his early years and musical education: he may have studied with the priest/musician Erasmus Lapicida, but sixteenth century Swiss scholar Joachim Vadian made the claim Hofhaimer was largely self-taught, while scholar-poet Konrad Celtis asserted he learned his keyboard skills at the Court of Holy Roman Emperor Frederick. ♦ was easily among the finest organists of his day, some of his contemporaries claiming he had no keyboard rivals. ♦ In 1969, in commemoration of the 450th anniversary of the death of Emperor Maximilian, the city of Innsbruck established the “Paul Hofhaimer Prize” for the interpretation of classic organ masterpieces. An international invitation for entry is hereby announced for the sixteenth competition which will take place from the 30th of August – 5th of September 2013. More below…. Innsbruck together with a certificate and the sum of € 5000,-. Two further prizes of € 3500,- and € 2000,- each with a certificate will also be awarded. the winners, two eliminative or qualifying rounds and a final are required. For the first qualifying round each participant is obligated to play the following mandatory pieces on the Pirchner Organ in the St’George’s Chapel of the State Parliament. Edizioni Suvini Zerboni, Seite 78 ff. Edition: Hans Leo Hassler. Sämtliche Werke XIII. Orgelwerke I, Teil I, Seite 136 ff. Musica Britannica XIV 28 Seite 86ff. Anfertigung einer Intavolierung eines Tenorliedes im Stil der Schüler Paul Hofhaimers. Nota bene: The critical analysis of the source material of the respective musical texts will be considered in the assessment of the candidates. Each competitor is free to choose the sequence in which he will play the prescribed pieces. The jury will select the prize winners from among the finalists. To conclude the competition, the winners will present a festive concert during which the presentation ceremony will take place. The definitive work on Hofhaimer is in German. In English, Hofhaimer’s music and that of his contemporaries are discussed in Gustave Reese, Music in the Renaissance (1954; rev. ed. 1959). William Hope Hodgson was a minor poet by all accounts. During the early 20th century, only two slim volumes of his poetry were published; these were collected, and reprinted, as his third. It took until 2005 for the next, and, though there have been more poems since, there have been no more publications dedicated solely to his poetry. Clasped in the strength of the Ocean’s caress. What are the words said? Are they the whisperings of the long-dead? Sobbing and moaning some solemn decree. In that wild calling so cold and so dree. Pregnant with terrors the dead only see. Please take a brief moment in time…to find out more of this brilliant writer. His simplicity understates the deep meaning held in every phrase, whispered through his deep fascination of some of the very elements in life that give rise to life in whole. del tuo piè di seguir del ciel le strade. My heart dissolves in tears, and sinks. Antonio Caldara is chiefly known as a composer of vocal music (operas, cantatas and oratorios), and is especially remembered for his operas, many of which are settings of librettos by Zeno and Metasasio. His stylistic development as a composer, however, has been described as a movement from works that are carefully crafted, with attention given to both musical and dramatic elements (his pre-1716 works) to music that becomes increasingly less detailed and texturally thinner (post-1716), reflecting Caldara’s pressing schedule in Vienna. Today, manuscripts of Caldara’s music are widely dispersed across Europe but his compositions which record so valuable a picture of the late Baroque in Italy and Austria are comparatively unknown to performers and little studied by scholars. Today Antonio Caldara is not a name many would recognise let alone regard as one of the ‘great’ composers of the Baroque, yet during his own lifetime and long after his death he was held in high esteem by composers and theoreticians alike. Johann Sebastian Bach, for example is known to have made a copy of a Magnificat by Caldara to which he added a two-violin accompaniment to the “Suscepit Israel” section. According to Mattheson, Georg Philipp Telemann in his early years took Caldara as a model for his church and instrumental music. Franz Joseph Haydn, who was taken to Vienna by Georg Reutter, one of Caldara’s pupils, sang many of his sacred works when he was a choirboy at St. Stephens and possessed copies of two of Caldara’s Masses. Wolfgang Mozart made use of some of Caldara’s six hundred canons in KV555, 557 and 562. Ludwig van Beethoven copied several contrapuntal examples by Caldara from a publication by his teacher Johann Georg Albrechtsberger, and Johannes Brahms is known to have possessed a copy of some of Caldara’s canons. “What a bottomless ocean we still have before us merely in the expression of words and the affections. And how delighted is our ear, if we perceive in a well written church composition or other music how a skilled composer has attempted here and there to move the emotions of an audience through his refined and text-related musical expression, and in this way successfully finds the true purpose of music”.